Shop with peace of mind that you're choosing from the highest quality and most reliable brands on the market. Offering over 3,000 products from over 50 different manufacturers. Featuring Laguna, Aquascape, Microbe-Lift, Aqua Ultraviolet, and many more! Dedicated to the design and distribution of efficient and effective linear air pumps, air diffusers and submersible water pumps. Reliability, performance, and efficiency are their highest priorities. Anjon provides complete custom waterscaping solutions for residential backyard enjoyment, commercial landscaping or large-scale recreational and beautification investments. Few experiences can compare to the pleasure and serenity that come from relaxing beside a beautiful garden pond. Whether keeping a fish pond or a water garden, API will help guide you to keep your water clean and clear, and your fish and plants vibrant and healthy. API makes it easy to maintain a beautiful, peaceful pond all year long. Specializing in high performance professional grade bead filter system and easy to install bottom drains. Bringing over 20 years of experience and patented products that offer outstanding quality, dependability, and service. Our complete selection of Aqua-Meds pond treatments and antibiotics will help remedy flukes, fungus, parasites, bacterial issues, and other common diseases that can harm your fish population. Aquascape prides itself on the passion of transforming yards into water features and ponds. They have dubbed this trend "Living The Water Feature Lifestyle." The Water Feature Lifestyle is what you experience owning and living with a water feature. It is how you interact with it, but even more descriptively, it's how it interacts with you! Aquascape offers everything you need to construct and maintain a backyard, or even front yard water feature. A global leader in the water garden industry. Atlantic Water Gardens offers innovative, quality water feature equipment for every taste and every area, from fountains and spillways to enhance the hardscape, to ponds and pond-free falls for the yard, LED lighting to illuminate them and all the accessories you need to easily install everything. Consistently recognized as the best in the industry, making them a favorite among homeowners and contractors alike. Escape to your own backyard and create magic in a single weekend. Beckett strives to provide quality products at affordable prices for everyone to enjoy. Offering a complete line of submersible pumps designed for every application. Including the reliable Versa Gold Series and economical fountain pumps with flow controls. BioSafe Systems' GreenClean is the original in USDA NOP (National Organic Program) and EPA-approved pond care products. Our full program offers an algae control alternative to harsh chemicals, while still ensuring a natural, healthy and balanced aquatic ecosystem. Safe for use in ponds containing plants, fish and other aquatic life, GreenClean pond care products are eco-friendly options designed to work effectively without complicated directions. Offering high quality, nutritionally balanced fish food for discerning koi and goldfish owners. Available in Growth, Color Rich, Wheatgerm, Blend and Platinum Pro - a professional blend diet. CalPump is your destination for pumps and lighting. Offering a durable and long-lasting product line ranging from submersible and external pumps, pond lights, and spillways for the common homeowner to the most advanced professionals. Carlisle fish-friendly AquaTough EPDM rubber pond liners combine design flexibility, long-term durability and easy installation, making them an ideal choice for a variety of waterscape applications. And amongst top competitors, Carlisle brand pond liners are the only brand that will give you the added benefit of J-Tear protection. Held to the highest quality standards in the world. Dainichi formulations originated at the most elite level of koi breeding in Japan. The only koi food in the world imported to Japan by top Niigata breeders. All Dainichi fish foods contain calcium montmorillonite clay. This clay contains compounds proven to be immensely helpful in enhancing digestion and growth, as well as neutralizing metabolic toxins. Dott Products provides a variety of aquatic filtration products used in the aquarium, aquaculture and pond markets. Materials are available in bulk rolls, cut rolls and mats sized and shaped for your specific filter requirements. For over 40 years EasyPro has been building innovation, quality and experience into every product they sell. Years of hands-on installation experience has allowed EasyPro to create numerous industry first products. From patented skimmers and modular spillways, to unique waterfall diffuser and fountain basins. EasyPro's product line continues to evolve designing products to fit the unique needs of every customer. Evolution Aqua are the number one manufacturer of Koi and pond filtration equipment. Evolution Aqua also supply Air Pumps, Fish Foods, Pipework and Fittings to the aquatics world. Award Winning treatments for ponds and aquariums, including PURE Pond, the PURE Pond Bomb and PURE Aquarium. A leader in bringing innovations and technology to the market. Offering a broad line of Deicers and Heated Products solving the problem of frozen water for animals during the winter. Providing high quality and reliable products. Firestone PondGard is your durable yet simple waterproof solution. High quality EPDM 45 mil synthetic rubber waterproof membrane designed to withstand the test of time. Specially formulated to be safe for fish and plant life, PondGard can easily be shaped to fit the unique contours of any size pond or complex landscape feature. Fomo Products manufactures the most innovative range of low pressure spray polyurethane foam in the industry. Use to simplify your waterfall construction. Offering specialty dispensing units for adjustable bead control and cleaners. Netting keeps falling leaves out of ponds and pools, and protects fish from predators. Multiple sizes available to fit your needs. Hikari offers a wide variety of diets for goldfish, koi and tropical fish. All Hikari foods offer you superior results. Scientifically chosen top quality ingredients are blended together to create unique specialized formulas to help your koi and goldfish grow to be strong and beautiful. Highly effective products for water treatment and fish health also available. Kasco Marine is a leading designer and manufacturer of floating decorative and aerating fountains, diffused aeration systems, surface aerators, and biological additives. Kasco continues to expand and innovate with a commitment to producing the highest quality products possible. Maintain an opening in pond ice and ensure proper gas exchange with K&H pond de-icers. Offering several models to accommodate ponds of all shapes and sizes. Laguna is dedicated to beautifully simple water gardening. Offering quality products designed for easy installation and lasting, worry-free performance. Laguna believes that water gardening should be a beautifully simple experience. This belief drives the development of products that make building and maintaining a water garden easy - from pumps, filters, and skimmers to fish food, decorative features, and maintenance products. Hardware can easily be connected using Laguna Click-Fit connectors. Established in Italy in 1991, Leader Pumps manufactures high quality water pumps for domestic applications. The Leader brand is among the largest domestic water pump brands worldwide and is recognized as one of the leading companies in this sector. Lifegard Aquatics is engaged in the business of manufacturing and supplying a complete line of pond, water garden and aquaculture products for the advanced aquarist, pond owner, professional landscaper or contractor. These proven quality products include life support systems for aquariums, outdoor ponds, fountains and water gardens, as well as fish hatcheries or other commercial installations. Lifegard Aquatics product line features filtration units, UV's, pumps, fittings, and other support equipment required for maintaining indoor or outdoor installations. 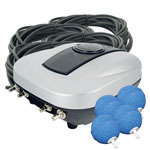 Little Giant is your destination for pumps for water gardens, pool, pond, aquarium, and fountains. Since 1941 Little Giant has provided the finest quality and innovative products available in the world. Offering a complete, durable and long-lasting product line ranging from pumps to pond lights, pond filters, skimmers and maintenance products for the most advanced DIYers and professionals. Liquid Rubber provides a wide range of water based and solvent free products for waterproofing, corrosion and chemical protection or where a protective decorative coating is required. These products cure to provide a seamless, fully adhered flexible membrane which prevents water ingress and resists damage from water, UV, salt, thermal cycling and harmful chemicals. M.A.N. is well known for their product innovation and industry-wide contributions, manufacturing and distributing of pond related products. Offering durable submersible filters, floating island planters, and planting media. The aim of Matala is to produce innovative filtration materials for application in the biological treatment of water gardens, wastewater, aquaculture recirculation, and various other applications. With Matala's extensive background in aquaculture engineering and plastic manufacturing, efforts were focused on creating and producing Matala filter media that offer superior technical characteristics compared to other alternative types of media existing in the market. Offering additional components such as aeration, vacuums, and filters - one look at Matala products will convince you of their practical and versatile qualities. Since 1934, Danner Manufacturing has been devoted to efficiently moving and filtering water better than anyone. Their innovative technologies have become well known by consumers and professionals alike in the areas of pond and water gardening, irrigation, aquariums, pool and spa, and hydroponics. With a family of top-quality, distinct brands, Pondmaster is king. Offering pumps, filtration, lighting, aeration, UV clarifiers, and more! Quality water treatments for your pond and lake. Offering a complete selection of dyes, natural and chemical treatments designed to keep your feature healthy and clear. The leading producer of aquatic fertilizers in this country, aquatics have been the number one priority since the beginning. Pondtabbs, aquatic fertilizer tablet, is the standard for the aquatic industry and is widely used throughout the world by commercial growers and hobbyists. Only available through Webb's Water Gardens. Made by Sequence Pumps, the manufacturing leader in high-efficiency, premium quality external pond pumps. The Quiet Drive Low Pressure series creates a great flow with minimal power usage, great for smaller ponds. The Quiet Drive Medium Pressure series offers energy efficiency and great performance at higher head pressure, a perfect blend of medium pressure and ample flow for the majority of ponds. Savio offers the most unique and advanced line of water gardening supplies available. Superior equipment, materials, and precision engineering are evident in the entire Savio line. Savio is more than a line of high-quality products - it is an integrated system for creating healthy, low maintenance ponds. Living ecosystems are central to Savio's philosophy: technology works in harmony with nature to create living ponds. Scott Aerator pond fountains and water aerators are high quality, eco-friendly pond management products. Enjoy the aesthetically pleasing qualities of our fountains and aerators and be amazed at how quickly they restore and enhance your pond's natural environment. These fountains and aerators are easy and quick to install and are nearly maintenance-free. Superflex Ltd., a NY based company engaged in the manufacturing of flexible spiral reinforced and PVC hoses. Since its foundation in 1981, Superflex has expanded to become a leading force in the hose industry. The quality of Superflex goods is world renowned. Since 1951, Tetra has been dedicated to helping seasoned hobbyists and beginners alike enjoy a successful, life-long aquatic experience. Offering filtration, fish food, water treatments, lighting, and décor. Their goal is to re energize the category by reinventing it - building fish, reptile, and pond keeping confidence, one innovation at a time. Tsurumi has been the most reputable name in water feature pumps for decades, and for good reason. Made with top-quality materials and components, Tsurumi pumps have commonly operated in water gardens for over a decade! With horsepower ratings from 1/5 and above, Tsurumi has the water feature pump that is just right for your pond, fountain, or waterfall. Specialized products for treating : Wastewater, Lagoons, Farm Ponds, Decorative Ponds, Septic Systems, Grease Traps, Aquariums, Industrial Process Water. For over 30 years Valterra has been a leading supplier of branded products for plumbing industries worldwide. Offering bulkheads, valves, hose clamps, and a wide variety of fittings. The people behind Valuflo pumps named the product line to reflect the stringent set of standards against which Valuflo performance is measured. Valuflo products were designed to achieve a unique level of economy - with high efficiency in a reliable, long-life pump. Valuflo products offer extremely low total cost of ownership.